Aboriginal art designs on Australia Gift Shop’s homeware and home décor products are original artworks by Australian Indigenous artists, either hand painted directly onto the homewares or an Aboriginal artist’s work printed onto the object. 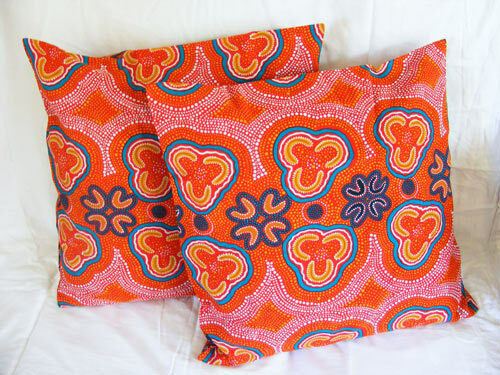 Home décor and homewares at the online store of Australia Gift Shop are all made in Australia and display Aboriginal art by Aboriginal artists. They are also distinctively Australian gifts and souvenirs for foreign tourists and friends and family living abroad. The visual elegance of these all-Australian Indigenous art pieces makes them ideal, not only as personal and family home décor, but also as interior décor for places of accommodation in Australia’s international tourism industry, such as resorts, hotels, hostels, B&Bs, holiday apartments and homestays. Aboriginal art homeware includes timber vases for the living room or dining room, trinket / jewellery boxes for bedside tables or the dressing table, and a variety of kitchenware and kitchen décor – namely, wine stoppers, wine holders, drink coasters, place mats, tableware, wooden spoon wall decorations and salad serving spoons. Hand painted figurines of the crocodile, kangaroo and koala, colourful cushion covers, display plates with stands, mini-didgeridoo or emu-caller on a display stand, and wall art such as framed Aboriginal artifacts and Aboriginal art paintings on canvas. The most relevant product category online in Australia Gift Shop is titled Homeware / Décor. Love your collection! Adorable stuff for decorating home beautifully. I like this article so much. Thanks for sharing. Thanks for your generous comment, Amanda!